Corona Extra and La Casa Artist Residency are bringing Donavon Frankenreiter back to Australia. Following on from a series of packed shows early last year, the surfing troubadour with that iconic moustache will be playing 30+ dates across the country, taking in Western Australia, Victoria, New South Wales and Queensland. Known and loved for his positive outlook and easy folk sounds, Hawaii based Donavon recently released his fifth full-length album Start Livin’. Recorded in Southern California over seven days, the album showcases Donavon’s rich, honey-thick vocals and masterful guitar work and bears all the intimacy of an impromptu back-porch performance. 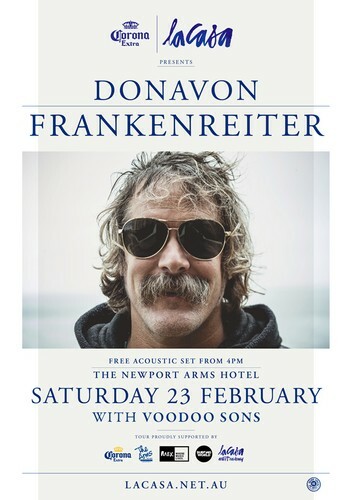 Donavon’s Australian set lists will include tracks from Start Livin’ and his entire back catalogue including favourites such as 'It Don’t Matter', 'Free', 'Move By Yourself', 'Lovely Day' and many more.